We delivered our petition and open letter! Wow what a big last couple of weeks – we did it! 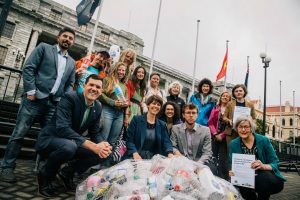 At 8.30am on Tuesday morning last week (Dec 2nd), Rowan and I went to Parliament to deliver a message to the government on behalf of more than 15,000 kiwis, calling for a cash-for-trash bottle deposit scheme, to protect Aotearoa from plastic pollution. With us were a bunch of friendly supporters and Wellington’s Mayor Justin Lester and we handed over our petition, from 15,450 people, and an open letter, signed by more than fifty supporter organisations, to Green MPs Chlöe Swarbrick and Gareth Hughes and Assoc. Minister for the Environment Eugenie Sage. We also carried a huge bunch of bottles in fishing nets with us, to highlight ocean pollution – which is a big reason why we want to get bottle deposits. Our petition was warmly received – both Gareth and Chlöe were openly supportive – and Minister Sage announced she had asked her Ministry staff to begin researching the feasibility of getting a scheme for Aotearoa – this is a big step in the right direction. If you were part of supporting our campaign, from signing our petition through to sharing our stuff on social media or running a stall, we cannot thank you enough! This is our next step – we’re just getting started folks! We’re excited for next year! Stay tuned everyone!